You can read the whole story from here. 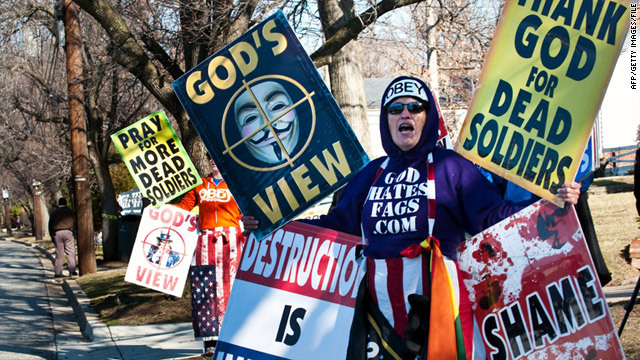 It's nut-bag Shirley Phelps-Roper and some random church form Kansas, that no one would have heard of if it weren't for the fact that they protest the funeral services of people who gave their lives so that these idiots can protest! This is very very high on the fucked-up list! It must be horrible for the families and friends of the soldiers. Why Shirley Phelps and her (i think now dead) husband are so adamant on hating gay people, to the degree of blaming the deaths of completely unrelated people on them? I can only assume that they have some extremely bizarre sexual persuasion, thats what it usually turns out to be when someone is extremely anti-something! To fight for and possibly loose their lives for people they don't know, rights to do things that they may not agree with, these men are soldiers and heroes and while I don't agree with the taking of anyones life, I do understand that there are times when it is necessary, and asking another human being to do this, regardless of if their life is at risk, is exposing them to a lifetime of mental/emotional torment, that I hope I will never have to go through! WBC has been around for a long time. I first started looking into them to see how 'cultish' they were. You can view numerous stories on YouTube and find some great insight. Interestingly, they're counterintuitive in that they seem to revel in negative attention. Part of their meme is that being shouted at and rejected by society as a whole is expected as the reinforcement that they are correct in what they're doing. Frankly, I'm glad they're around. If nothing else, they are true to what the Bible ACTUALLY says. If you want to see what living biblically looks like in a modern context and how f*'ed up your beliefs as a Christian really are; look to WBC. 'To wit' (inside joke) they continue to protest as their calling. They like to think that we're in the last seconds, minutes, hours before Christ returns; so surely all their work isn't for naught. Public derision only cements their belief that they are 'right' and the faithful will continue to 'declare the Word' no matter how fruitless it might seem. They believe the Bible when it says that their protest will only harden the hearts of society at large. By failing to convince the multitude, they're proving the Bible right! They have provided a valuable public service with their recent Supreme Court win however. WBC successfully defended their right to free speech; regardless of how obnoxious or inappropriate that speech might be. They follow proper procedures for time and distance and what they do is legal. Part of public discourse is having to listen to people like them; as distasteful as it may be sometimes. I'm certainly glad to have the freedom to lambast them once in a while. They are true to the literal reading of the bible. It reminds me of the letter, Why Can't I Own a Canadian. Where the author questions how best to follow the bible, literally, with questions like does the whole town really have to get together to stone a person who wears clothing from two different thread sources, to death or can just a few people kill them? Amongst other outrageous, and unmistakable commandments in the bible.